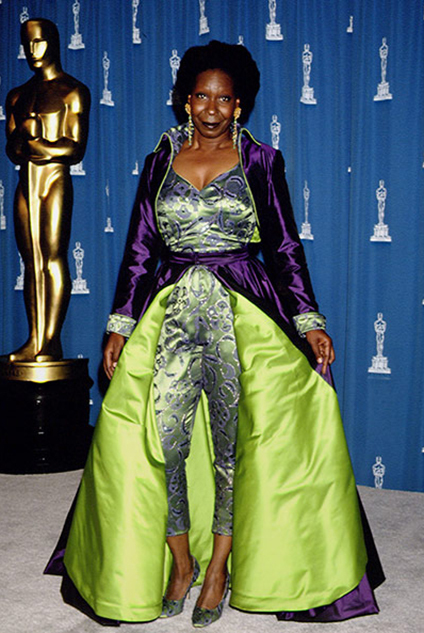 With the Academy Awards coming up this weekend and today being that special throwback day of the week, we’re bringing you our favorite #tbt fashion faux pas from past Oscars. We may not have the most refined taste in red carpet dresses, but we know ridiculousness when we see it. So this year, get the whole crew together for an Oscars watch party… SquadUP style! This looks like it could be a dress in Mugatu’s “derelicte” line or another one of his innovative collections from Zoolander. I guess rich people’s trash is mostly made up of gold credit cards? American Express wouldn’t even let her wear this in the movie she won an Oscar for, let alone pay her to show it off at the main event. Yikes… where to begin? The fedora? You can rarely say this but the fedora may be the least of her problems. It’s like MC Hammer made a white suit. And then Celine decided that wearing it forward would somehow be too normal? Yeah, let’s put it on backwards. Cool. Sorry, Whoopi, but there’s no way around this one. You take the cake. And we’ve decided to award you a king cake for rocking this dress that makes you look like you should be headed down to New Orleans for upcoming Mardi Gras celebrations. This outfit is top-of-the-float worthy. We had a lot of laughs writing this post. Needless to say, SquadUP’s fashion sense is still in development. Did we get it right? Thoughts? Comment or tweet @SquadUP.